SalesDirector.ai is designed to be an AI-enhanced sales forecasting and coaching solution for enterprise sales teams. "I wish I had this earlier in my career"
It makes my life easier and the life of my sales team easier. I have full visibility on how each opportunity is tracking and the current trend for that particular month/quarter from an easy to use view. Additionally, the relationship plan feature actually accelerated some opportunities to close sooner. For me, the ability to see through some of the fluff and feel very confident about my weekly sales forecast was a priceless. Three is a bit of a learning curve to get started but the customer success team was always available to jump on the phone and walk me through any questions I had. It fills in the gaps that Salesforce cant quite do. The salesforce sync allows it to be up to date at all times. I find myself generally doing all pipeline and forecast reviews out of SD.ai instead of SF now. Forecasting reliability, advanced reporting, opportunity management. "A Must for Your Sales Organization"
While there are a lot of features we absolutely enjoy such as reps being able to text the tool to update records in SFDC and automated SFDC activity logging from synced email accounts, my favorite is sinking contact roles through the relationship plan. When SalesDirector.AI combs through emails, it identifies contacts the reps are communicating with and enables the rep to include them on the relationship plan. When they do this, it also adds the contacts in as a contact role in SFDC. If the contact does not yet exist in SFDC, SalesDirector.AI will create the contact for you. Our marketing department is happy as they can track campaign member influence more effectively, our sales leadership is happy as they can review customer engagement on opportunities to ensure we are not single threaded and our reps are happy as the administrative burden to create contacts and add them to opportunities is all taken care of for them. Lastly, Sales Ops is happy as we are able to add another indicator into our predictability scoring for our forecasting process. There isn't anything that stands out at this time. This tool is a solid add for any sales organization. It helps provide insight your out of the box CRM is incapable of without a significant level of effort of development on the back end through coding and reporting. This tool for me is akin to having another employee on my team. "Powerful insight into sales life cycle, enabling growth acceleration and credibility in forecasting "
SalesDirector.ai takes a unique approach which appeals to multiple types of users by combining; (1) credibility in pipeline forecasting through visibility into and validation of sales forecasts and related activities, in an objective methodology, tied directly to our specific sales process, the sales reps actual activities performed and the validated customer interactions, and (2) providing sales reps real-time guidance, training, and value; overcoming many of the historical obstacles of adoption by sales teams. Although constantly improving, the visualization of the various outputs are not quite as sleek as some of the other solutions in the space, but this is significantly overshadowed by the approach and insights gained in comparison and the service from the team. Focus on refining and locking down the sales processes and desired sales behaviors early as that unlocks a lot of the value through alignment and real-time feedback and training benefiting the sales reps.
(4) increasing credibility in results & reporting through simple & clear visibility to a single source of truth. What AI Sales Assistant solution do you use? This tool helps us understand our pipeline, act on high priority items in the sales cycle, understand what is going on in our business, and if that is not enough it also makes our CRM better through various integrations all the while creating less headache for our Account Executives. Some of the features are a work in progress but we enjoy being on the journey with them and testing what they come up with next! If you are looking for real time insights, sales enablement and forecasting without a lengthy and painful implementation process than this is the right tool for you. "Instant Insight into All Open Opportunities!" SalesDirector.ai gave me clarity into all of the open opportunities in our sales pipeline. I could see in one easy to understand window, the recent communication occurring from my rep to their prospects. And I could see when the prospect responded and get a quick feel for the sentiment of those response emails. I could see when the last meeting occurred and when the next was scheduled. Also, the AI in the program gave me it’s input on the likelihood of a deal closing based on its understanding of how similar types of deals closed in the past. It also provides a great view of not only the people that are being communicated with at a target account, but also it uncovers people that the rep probably should be communicating with based on personas that have been involved in similar closed opportunities. It provides a huge benefit by taking most data entry out of the hands of the reps and does it for them. The rep can literally create a voice to text message after they have attended a meeting, and that data is captured and entered into Salesforce. Nothing really. It takes a couple of training sessions to get the reps comfortable with the interface, but once they do, they start using SalesDirector as the go to source for all information around their deals. If you are a new sales leader coming into an organization, I don’t think there would be a better tool for helping you get up to speed on things like, deal velocity in each sales stage, where your reps are spending their time, are they communicating more with the target company or are the getting bogged down with internal communications around the deal, where deals are entering and exiting the opportunity funnel. And for a seasoned sales manager, I haven't seen any product gives a better view of what is happening around an individual opportunity. This gives a manager insight to be able to jump in and assist on deals early enough to make a difference. Providing a more accurate forecast and helping the reps move deals through the funnel to close. The reporting capabilities are great - especially for non salespeople - providing insights into changes to pipeline and an ability to easily get progressively more level of detail on pipeline, changes, etc. Some of the parameters for classification (eg. what is in "commit") are opaque out of the box. Automating pipeline reporting, making it easier for salespeople to keep the opps current and up to date, assisting salespeople in managing their sales process and providing insights into next steps. 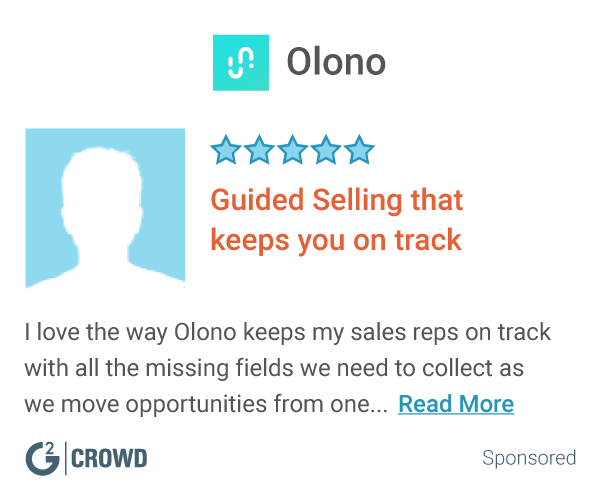 "Extremely helpful, AI engine works beautifully to provide sales insights. Very nice User Interface"
CRM can be daunting and complicated. We find that we operate within the SalesDirector.AI shell and do not need to spend as much time inside our CRM as a result. The data is useful and organized and the interface is well designed. Some features are still in beta but that is normal as a new product evolves. Customer Service is exceptional. The team is extremely responsive. Some users shied away from using CRM. SalesDirector makes sales tracking easy. The SMS messaging meeting followup feature helps us stay on top of customer follow ups. SalesDirector.ai delivers critical pipeline and productivity data without burdening the sales force with extra work. It is a great tool for pipeline reviews and coaching. Since we have an on premise version of MS Dynamix the data is not as dynamic as we would like. This is not a flaw in SD, it's more of an issue that we have internally. In fact, it's a miracle that the team could get it to work at all given our version of CRM. "Good product that is still a work in progress." I like that it can help help log notes in SFDC through the voice to text feature after a call. I hope to see more assistance with automation of various time consuming administrative work that I do as a Sales Rep.
Lag time between entry into SFDC and Salesdirector - although this seems to be improving. Helpful to provide visibility to management of progress and actions I am making with opportunities. Also helps keep me on track and automate some mundane processes. I love the SMS text reminder. After my customer appointment, I literally got a text within 5 minutes, to which I responded and my update on the meeting went right into SalesForce. No excuses for not updating! My sales team should be able to do this from the lobby or from an Uber! Right now there is nothing I dislike. I am still experimenting with everything that it can do for my Sales team. It is time consuming and awkward to update SF when you are going to a restaurant or running to an airport after a client appointment. This makes is all doable, efficient and effective! Enhanced Sales Reporting and Funnel Visibility. "Increasingly useful and impressive "
The visual layout & gamification of opportunities, including suggested actions, relationship & activity ratings, etc., is helpful in progressing opportunities and ensuring we're all focused on the end-goal/outcomes. Still a few bugs, but understandable as it's a new, evolving product. Forecasting & Sales Productivity. This has helped us stay on the ball, focusing on continual progression towards the end outcome. Intuitive.... that it takes all of the admin and folllow up in Salesforce... away. This makes things great and life easier. That, with a text, Salesforce gets updated. This makes my life a lot easier. The product gives me talking points for my one on ones with my team. It is a new product so it is always evolving which means great features are always coming into the product without the best training or awareness. Sales Productivity and Forecasting. I have seen an impact on my sales team to manage their deals proactively which is yielding a stronger commitment to forecasting. "Amazing tool for managing a team!" Sales KPIs brought to a new level. Powerful email integration and tracking. In my opinion it should be 100% inside the CRM. It makes you have to use another tool for your daily monitoring. * We monitor all SalesDirector.ai reviews to prevent fraudulent reviews and keep review quality high. We do not post reviews by company employees or direct competitors. Validated reviews require the user to submit a screenshot of the product containing their user ID, in order to verify a user is an actual user of the product. Hi there! Are you looking to implement a solution like SalesDirector.ai?